The words “sushi burrito” conjured up images of raw fish paired with beans and rice wrapped in a tortilla. Luckily, this is not what I found at Bento Moderno, which calls itself as an Asian-fusion restaurant (though it’s more Asian, than fusion). 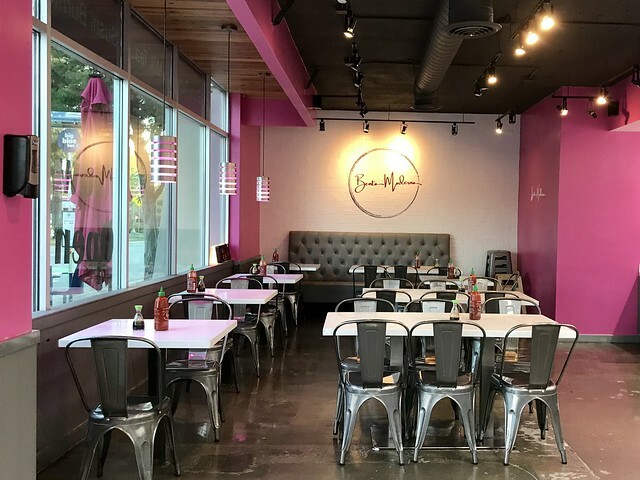 With an fondness for hot pink in their decor, this fast casual spot serves sushi burritos, poke and teriyaki bowls. Located near the office park by the Santa Monica Airport, Bento Moderno was pretty quiet on a Saturday evening. Street parking was easy to find and free after 6pm. Most menu items range in price from $10 – $14. If raw fish isn’t your thing, they have teriyaki chicken and braised beef, available in both burrito and bowl formats. For vegetarians, there’s a teriyaki tofu bowl. Boba lovers can select from a large menu of milk teas and smoothies, to which those tapioca pearls can be added. Our counter server must have been a new hire, because she needed to refer to the menu as she made our “burritos.” There are no tortillas or beans, but there is rice on top of a seaweed sheet. 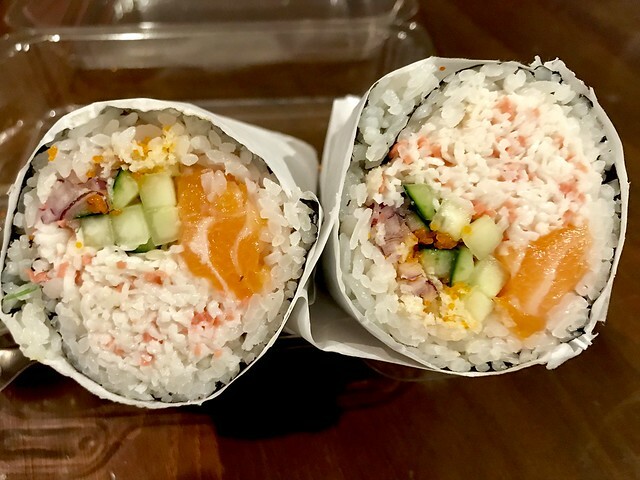 The sushi burritos, which were more like a giant version of a sushi roll, were a little on the pricey side – however, she packed so much into it, that the pricing seemed somewhat reasonable. There’s a dining room with pink walls and some outside seating on the sidewalk, should you wish to eat there. Not wanting to be their lone diners, we brought ours back home. 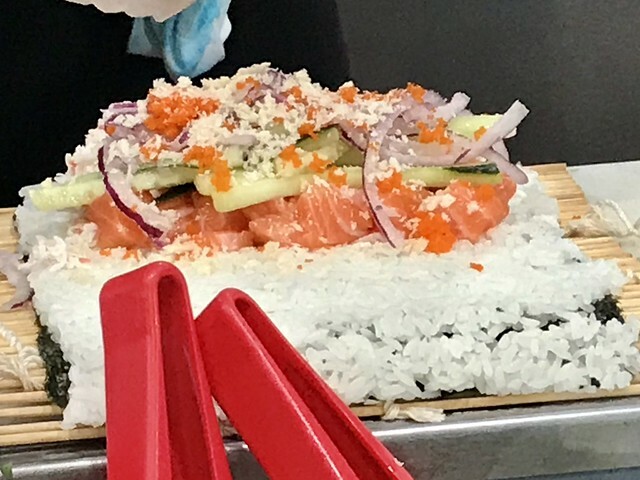 The Salmon Sushi Burrito had salmon, kani kama (which I didn’t know what it was but turned out to be imitation crab), cucumber, onion, masago, and panko. The roll was almost half stuffed with imitation crab. I like imitation crab, so I didn’t mind, though the raw onion was a bit overwhelming. The panko crumbs got kind of lost and didn’t provide much crunch. 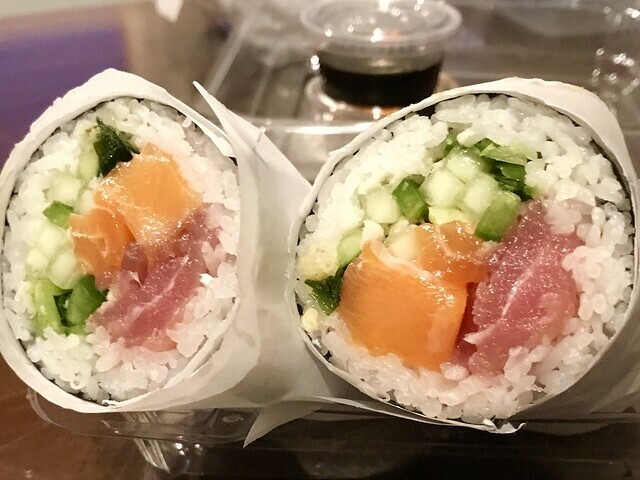 Since it was so heavy on the imitation crab, you’re probably better off saving $3 and getting the California Sushi Burrito, which doesn’t have the salmon, or spending a $1 more and getting the Tuna and Salmon Sushi Burrito. That burrito, which the most expensive item on the menu, had tuna, salmon, jalapenos, cucumber, green onion, and panko. The had run out of the eel sauce in the squirt bottle that was suppose to go in it, so we had it on the side. That extra $1 gives you much more fish and seemed like a better bang for the buck. The sushi ingredients were fresh and of good quality. 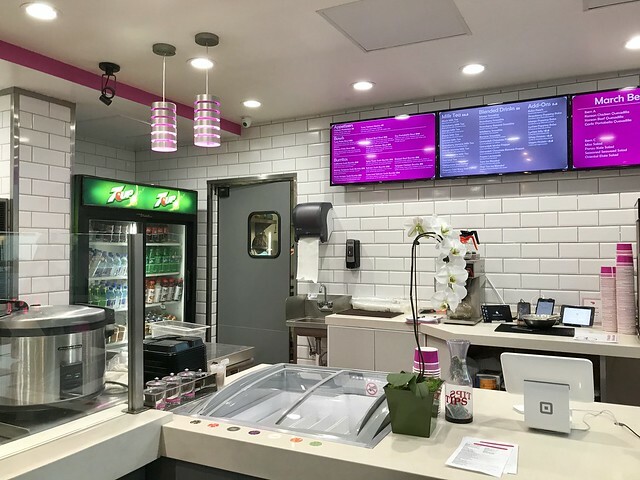 The food at Bento Moderno may not quite be Asian fusion, but it’s perfect for our healthy SoCal lifestyle. Oh, and if you love the color hot pink, it’s definitely the place for you.